A customer support chatbot can engage users, reduce costs, provide 24/7 service, extend your reach and provide a business edge. 265 billion customer support requests are made every year, and it costs businesses $1.3 trillion to service them. Chatbots can reduce these costs significantly when companies upgrade from antiquated, inefficient IVR technology to AI powered chatbots. 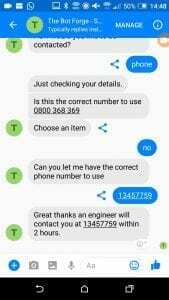 This is our example of a technical customer support chatbot for a fictional company which sells printers and scanners. *We are currently busy with other projects so the demo is not currently live, we can arrange for a live demo, contact us for more information. 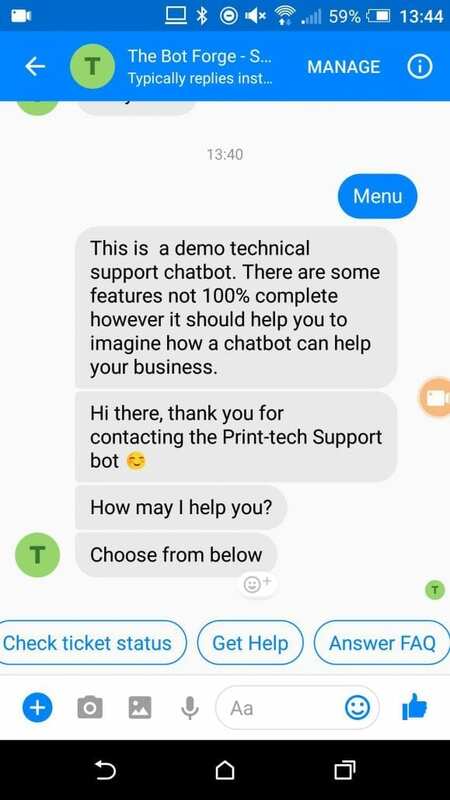 Create a demo chatbot which will be capable of answering the more common technical support queries related to the scanners and printers which the company sells. The bot will provide an idea of what a fully functioning chatbot is capable of. Highlighting the scope for integrating with existing back end systems. In this case using a tech support ticket system, product inventory and other internal system integration to answer customer queries. 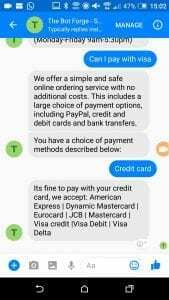 The bot will be integrated into a the Facebook Messenger platform. As this was a demo chatbot project we wanted to use the exercise to highlight possible backend integrations which we could carry out with a live project. The facebook messenger integration in which the chatbot was delivered enabled us to use some more complex UI elements to enhance user experience. The Chatbots aim was to support 3 technical support conversations. The support chatbot has been developed to mimic a live application which has some back-end integration with existing systems. The chatbot provides 3 levels of integration. Product listings – the user is able to drill down through product category choices when trying to get help for a specific problem. Product lookup by serial number – the user provides a serial number which the chatbot uses to lookup the product details. We decided on the Facebook Messenger platform for where our demo chatbot is going to reside. Get help, Check current ticket, Ask FAQ. The bot also supports small talk by default, it will respond with predefined phrases. These can be tailored. Understanding the users’ needs, behavior, and expectations. This bot would serve current customers of the company requiring assistance with their printers/scanners. We are able to leverage some of the more advanced UI elements in Facebook Messenger. Cards, Quick Replies, Images, Buttons. We can use the extensive training capabilities of the Dialogflow platform to fine tune the chatbot user experience. We can provide analytical data on chatbot sessions, queries per session, top intents handled by the agent and exit rate per intent.